To achieve the perfection needed. The whole world is looking for miracles. Every day it is dying to see miracles. I do not need miracles, please. A crying heart and a smiling life. Question: Do miracles have any value? 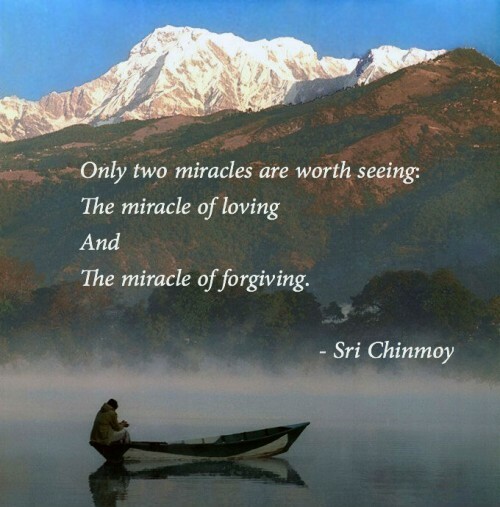 Sri Chinmoy: The greatest miracle is to remain for one extra second in a divine consciousness. If you can remain one second more in a divine consciousness, then that is the supreme miracle on earth. Miracles will not help you achieve God-realisation. Far from it. In fact, miracles can create all kinds of problems. There was once a Master who had occult power which attracted many disciples, but God told him to stop using it. Then he started telling his disciples that he had lost all his power, so that the miracle-seekers would leave him. Then he began a real spiritual life. The real miracle is to remain in the highest consciousness. It is not the miracles that Christ performed that compel the world to adore him, but the infinite Compassion and Love which he eternally embodies.